Outsourcing was first used by manufacturing companies about 50 years ago and has been spreading across the world and the industries ever since. While the major reason for outsourcing has always been lower costs, is it now increasingly used as a strategic tool necessary to gain a competitive advantage. 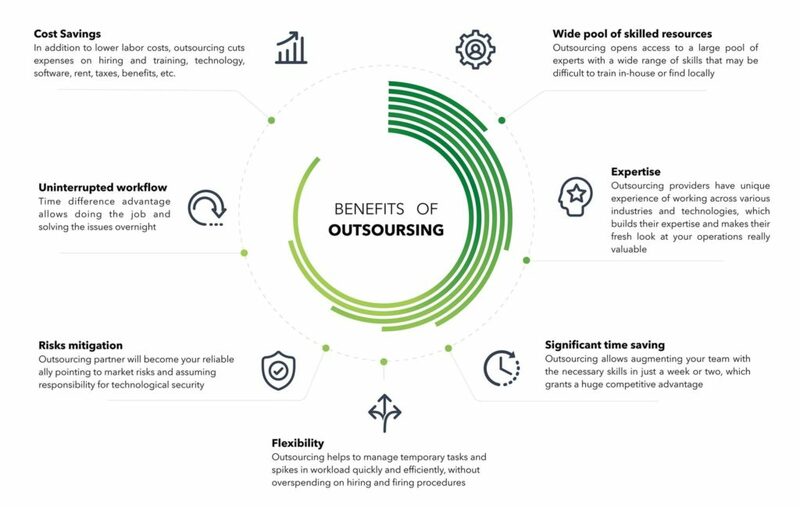 Notably, Michael F. Corbett, the author of a white paper released by the Economist, argues that, “Outsourcing is no longer just about cost saving; it is a strategic tool that may power the twenty-first century global economy”. If you still haven’t found a good reason why to outsource, it’s high time to look at these pros of outsourcing – note, a price tag is just one of them. Access to a wide pool of skilled resources. A large pool of skilled professionals has become one of the main reasons for outsourcing. The rapid development of technologies, methodologies and techniques makes it difficult for one company to have enough skills and resources to quickly respond to new trends. Moreover, in some regions, hiring a qualified and experienced IT specialist locally has turned into a real endeavor only best head-hunters can deal with. So, it is a wise decision to have a technical partner who specializes in providing skilled IT resources and can satisfy your needs in skills and technologies on demand. Expertise, increased efficiency and innovation. In-house specialists know your company and business processes best. Nevertheless, this very advantage makes it difficult for them to look outside the box, innovate, spot inefficiency in the processes they are used to, suggest original solutions. Augmenting your staff, you gain a fresh insight from the professionals with extensive expertise across various industries and technologies. This is why outsourcing is now associated with innovation and increase in efficiency. The chance to be the first. Having a winning business idea, companies often lose a momentum spending too much time realizing it. Some companies wait months before an engineer joins their staff and spend additional time training the newcomer. Overall, finding talented IT resources takes about half a year and impedes companies from immediately grasping the market share and enjoying the benefits. IT outsourcing is a proven way to scale fast or quickly build technological capacity to realize the project, which will give you a huge competitive advantage. Efficient mitigation of crises and spikes. Sometimes, a particular skill is needed only for a short period of time; for example, to deal with an issue or a spike in workload. In this case, it makes no sense to spend much time and resources on hiring an in-house employee who might be fired a few months later. Thus, the ability to quickly address temporary needs is another advantage of IT outsourcing, which proactive and successful companies leverage. Risks mitigation. A professional outsourcing provider will be your reliable ally that will point to risks you have overlooked or advise on the ones you are facing. What is more, it is always difficult for a non-IT company to mitigate internet security risks, which may drain millions in case of ransomware or other hackers’ attacks. Having specific industry knowledge, outsourcing providers manage much of this risk for you. Uninterrupted workflow. Skillful management makes time difference one of the advantages of outsourcing. The ability to have the work done overnight by the offshore team helps the companies build an uninterrupted workflow and address all the issues the moment they arise. At the same time, such solution presupposes that employees are never compelled to work overtime or unsocial hours, which translates into less expenses, less stress and more job satisfaction. Cost savings. Today, labor costs do not provide such big savings as they used to 15 or 20 years ago. Talents leverage the unique ability to work and live in whatever place they chose, and market players are ready to pay a fair price for the adequate skills and experience. 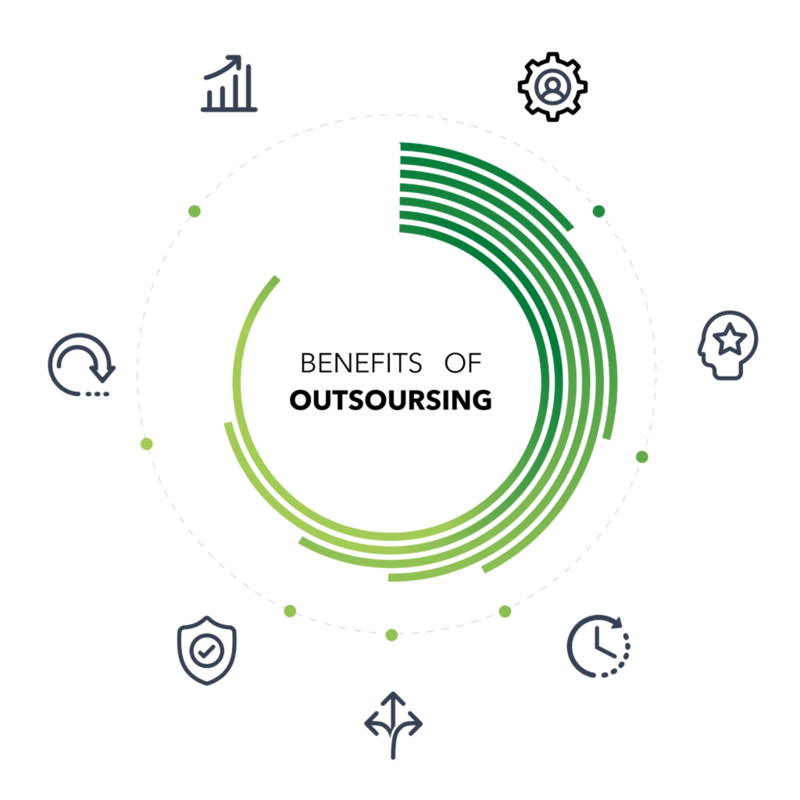 Nevertheless, outsourcing still helps to substantially cut costs eliminating expenses on hiring and training new employees, providing technology and software, renting premises, paying taxes and benefits, etc. Why overspend on these hidden costs when the money may be reinvested into innovation and sustainable growth?